Commercial Electric MS2015A is a multi-featured clamp meter. 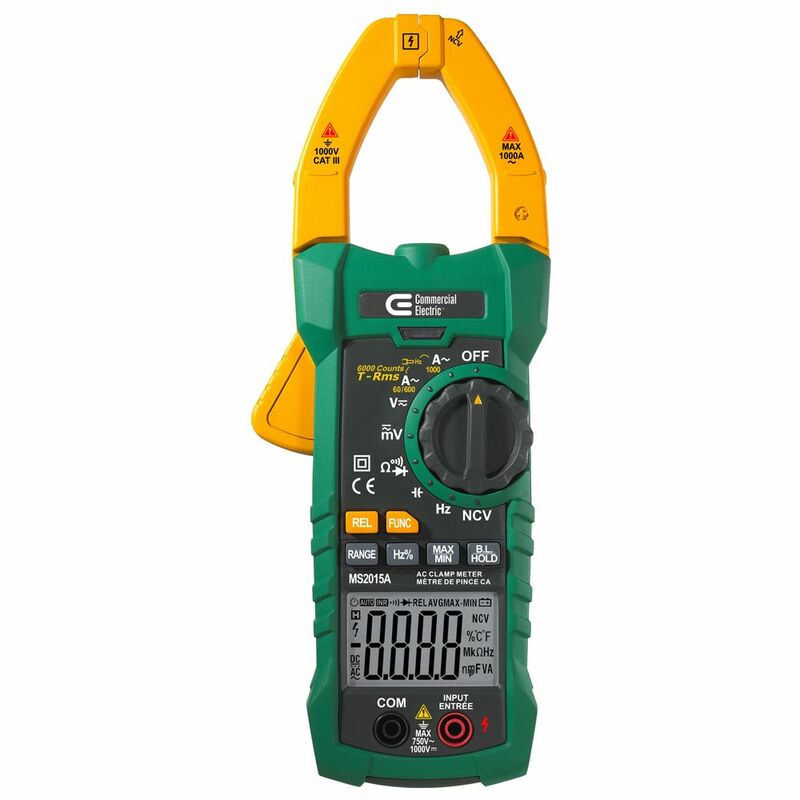 It measures AC/DC voltage, AC Current, resistance, capacitance, frequency and duty cycle. It can also test diodes and continuity. They are designed by electricians for electricians. WARRANTY: 12 Months For one year from the date of purchase, this product is warranted against any defects in material or workmanship. This warranty is void if this product is ever used while providing commercial services or if rented to another person. Contact the Customer Service Team at 1-877-527-0313 or visit www.HOMEDEPOT.com. The 407730 is a sound level meter that measures from 40 to 130dB with an accuracy of 2dB. The digital display offers a 0.1dB resolution and features a fast responding analog bar graph. User can choose A or C weighting. Max Hold captures highest reading. Includes microphone wind screen and four AAA batteries. Digital Clamp Meter Commercial Electric MS2015A is a multi-featured clamp meter. It measures AC/DC voltage, AC Current, resistance, capacitance, frequency and duty cycle. It can also test diodes and continuity. They are designed by electricians for electricians. Digital Clamp Meter is rated 3.0 out of 5 by 2. Rated 1 out of 5 by Carefull with tools from Disappointing product Bought product over a year ago used twice then stored in tool box for about a year. Unit would not turn on. Replaced battery but unit would not turn on.